| iSEE In the News | NACS Cool New Products: Where Are They Now? Snippets from a recent NACS article: NACS Cool New Products: Where Are They Now? iSEE Store Innovations debuted both its iSEE Icelight Cooler (2013 winner) and iSEE RollerChill Fridge (2016 winner) at the NACS Cool New Products Preview Room. The iSEE Icelight Cooler has a clear glass front to display beverages on ice, while the iSEE RollerChill Fridge uses lighting and motion to draw attention to the beverages. The company did sell a number of the LED coolers, but the bigger sales came from retailers visiting the booth and discovering the other products the company offered. ‘The LED cooler brought people’s attention to our booth and products,’ Vonder Haar said. After the 2016 Show, several major c-store chains, including Circle K and 7-Eleven, began pilot programs with the iSEE RollerChill Fridge. 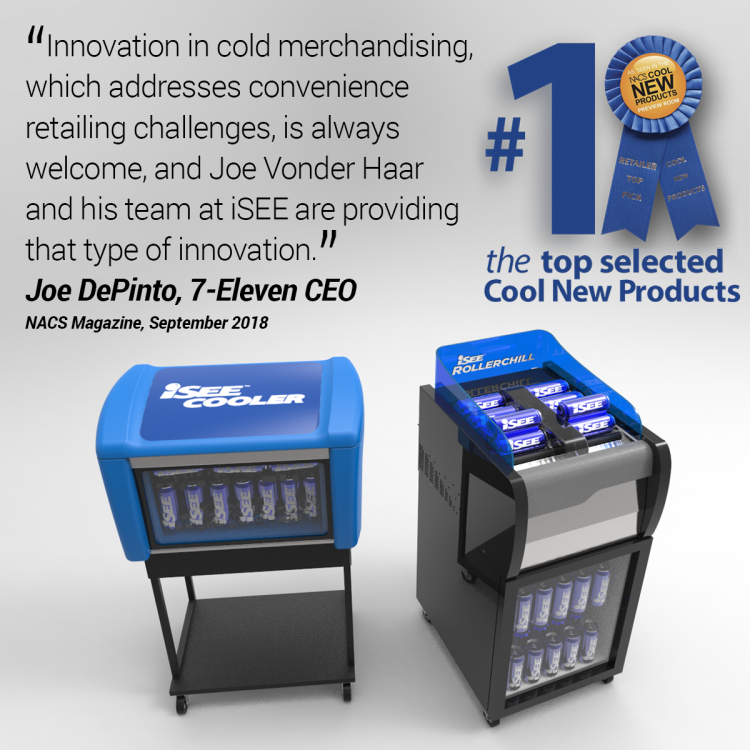 ‘Innovation in cold merchandising, which addresses convenience retailing challenges, is always welcome, and Joe Vonder Haar and his team at iSEE are providing that type of innovation,’ said Joe DePinto, 7-Eleven CEO.